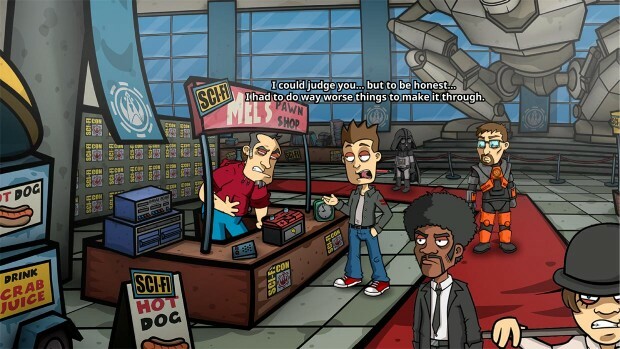 It’s rare that a game can encapsulate as many pop culture references and geeky bits of humor as Randal’s Monday, but this upcoming point-and-click adventure title from Nexus Game Studios manages to do so in spades. The game will feature Randal, voiced by Jeff Anderson of Clerks fame, traveling through space and time in a quirky animated world to fix the many wrongs he made in a single night. The voice acting is superb across the board, and the humor is crass but endearing. Expect to see pop culture references like these very often. The mechanics are solid, and reminiscient of many classic point-and-click adventures. While the puzzles are interesting and require the player to put some thought in, there was a grateful lack of illogical solutions. Every puzzle solution felt rewarding, and progressing through the game felt entertaining and natural. Each of the game’s nine chapters (seven main chapters, with a prologue and epilogue) will feature new puzzles for the player to solve, but with the bonus that some things carry over from the previous “loop.” As Randal repeats the same day over and over again, you’ll get to delve deeper and deeper into the cause-and-effect of each of his actions. It has a very Groundhog Day feel to it, in a very good way. The cast of characters grows larger with each repeated day. The game is expected to release in November on Steam for PC, with no price point set yet.